I recently got the following email from a reader who is looking for advice. Speak up with your 2¢. We live in a 100 year old frame farmhouse. We had to replace our oil furnace last year and we went with a Geo-thermal. No regrets yet but it does take more hydro to run it than we usually use and I hate to use more hydro than necessary. However, even though we don't use fossil fuel any more, it seems every year we have to turn the furnace on earlier and earlier, and shut it off in the spring later and later. I have an autoimmune disease which leaves me feeling cold all the time, so when the indoor temperature hovers around 62 F, I am freezing. I already dress with 3 layers on but do not feel warm until the house is about 72 F or warmer. On the days I am home all day I will start the wood burning stove in the kitchen, however, when I am not home, we do not start it some days until 6 pm and then in the morning, the house has lost most of the heat, especially the upstairs. If we both leave for work in the morning, we cannot put the wood stove on. Based on my simple research I have found that for space heaters, watts per square foot of room have been between 7.5-12.5 watts depending on the amount of insulation, age of home and draftiness. When I can't decide on a space heater I will always go with the larger one as I can drop the amount of output and over time the "heat factor" can weaken. Here is a link with more info. Do you have any suggestions for an economical way to the heat the house? Do you know what wattage is best for space heaters? @extremejacob said: More layers, increased cold tolerance, higher metabolism, more muscle, more fat, eating warm things, moving more, hat. Or invite 10 people over. Each person is worth a 100W space heater. Alternatively have them do stuff, like cleaning or playing dodge-ball and that number jumps quite a bit. We heated a 3-story split level in Baltimore with a wood stove on the lowest level. It was comfortable (65 or above) most of the time. In addition to the obvious sweater or robe, our attire included wooly hats, fingerless gloves, socks and slippers. However, we were young and healthy. Cold = stress. It drains your physical health faster than high energy bills drain your wallet. IMHO, I'd opt for a slightly bigger hydro bill to offset potential health issues. I haven't really needed to heat for a long time. My condo is situated above and next to two others. I get plenty of heat from them. Nice! How do you stay semi-warm outside? I suggest a thick cap with earflaps (or just earmuffs). It's amazing how much heat escapes through the head. I'm planning on knitting myself some fingerless gloves here shortly. How about an electric blanket if you find yourself sitting for a while? In the summer I close the blinds on the west and south-facing windows. Now I'm leaving them open during the warm part of the day if it's sunny out. Is one of your layers thermal? I'm a big fan of blankets...and I bake in the oven instead of cooking (think casseroles and baked chicken). Thank you all for your advice, I have sent the link to the reader and they have access to your info as well. But don't let that stop you from adding in your thoughts. Keep them coming! I rent half a big old Victorian house in Michigan and ooh it does get cold, especially right now. Looking into how well-insulated your home is would be a good step to take... it costs more in the short term if you find you should add insulation (in the attic, I would guess) but in the long term it will sure help conserve heat and keep you feeling warmer. The other thing we do is cover our windows with plastic sheeting on the inside in the winter... It doesn't look elegant, but it cuts down the drafts immensely, and we can turn down the thermostat to 60 and it's fine. we also make sure that doors that lead to the front and back halls are closed tight and well-sealed, and we don't heat the entryways actively, just the living areas. My hands still get cold at the computer all day, but I was given a pair of knit fingerless gloves last winter and they really helped. Good luck! I often have very cold feet in the winter. Socks and blankets don't always do the trick... it's like the feet need a jump start, and then the socks will keep them warm after that. I'm a huge fan of using a hot water bottle! Before I go to bed (or if I'm just watching TV, reading, etc. ), I fill a hot water bottle and rest my feet on it. 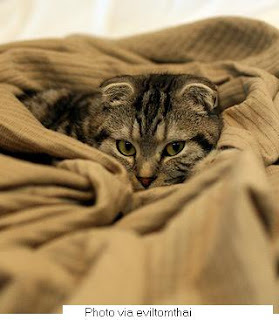 It's amazing how long it will stay warm and keep you warm when it is under the blankets with you. Throughout the winter, my feet stay very toasty! It's relatively inexpensive (about $10 for the bottle if you don't have one and about 1-2 cups of water per use).